I adore the Alice in Wonderland illustrations by the artist Sir John Tenniel.I have many rubber stamps of these illustrations and decided to use them in my jewellery. The back of the brooch is covered in a velvety paper with a 1ich silver plated pin. Trivia for you-Hat makers used mercury in the hat making process which gradually effected them leaving them mentally confused, hence the phrase "Mad as a Hatter". 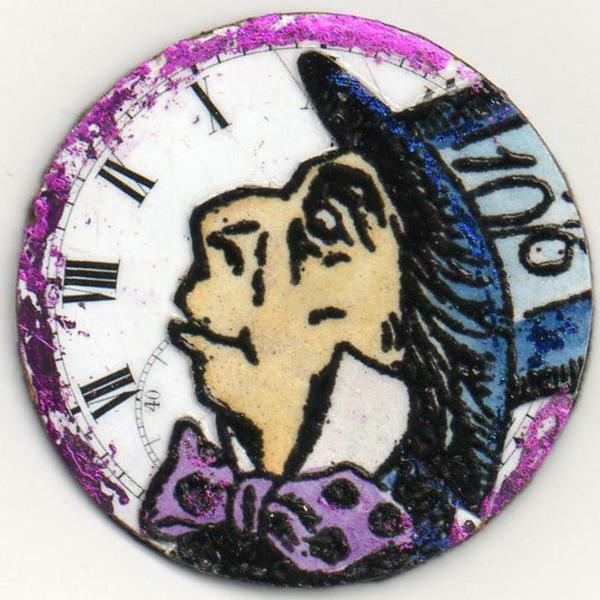 Even if this piece says it has been sold, please contact me to see if another can be made.Also if your interested in another Alice in Wonderland character for the brooch please contact me.